Dawn Calhoun is a mother of 2 daughters, a wife, daughter, sister, and a 11 + 3 or 14-year breast cancer survivor. Dawn learned that she had breast cancer in 2004 while she was in her 30’s. Her girls were 3 and 7 years old. Instead of wallowing in what could have been devastating news, Dawn fought and won that round of cancer. In 2015, she felt something in her neck and decided to follow-up. That’s when she learned that she had stage IV metastatic breast cancer. Living with breast cancer doesn’t stop Dawn in the least. She’s a cyclist, marathoner, and half ironman competitor, and she believes that moving forward one step at a time has been the key to her success. SI | Dawn, we are so inspired by your story. Can you tell readers a little more about yourself? Dawn | Let’s see, where do I start!? I am originally from New York. I moved to North Carolina over 30 years ago and I never went back. I have two beautiful girls, a hubby, a brother and a mother. I am an 11 + 3 or 14-year breast cancer survivor. I was first diagnosed in 2004 and at that time, I was stage 1. I went through chemo, radiation, and a couple of surgeries, and I was cancer free for 11 years. In 2015, right after the passing of a friend to cancer, I felt something in my neck. I went to the doctor and was referred to my oncologist because of my health history. After a variety of tests, lab work, biopsies, and everything in between, it was determined that I had stage 4 metastatic breast cancer. This was the restart of my journey. SI | Thank you for sharing. You mentioned that it was in 2015 when you found out that your cancer returned. I bet that was devastating. How did you feel and how did you cope with this diagnosis? Dawn | It was devastating and crushing. My oldest daughter was about to graduate high school and go off to college. 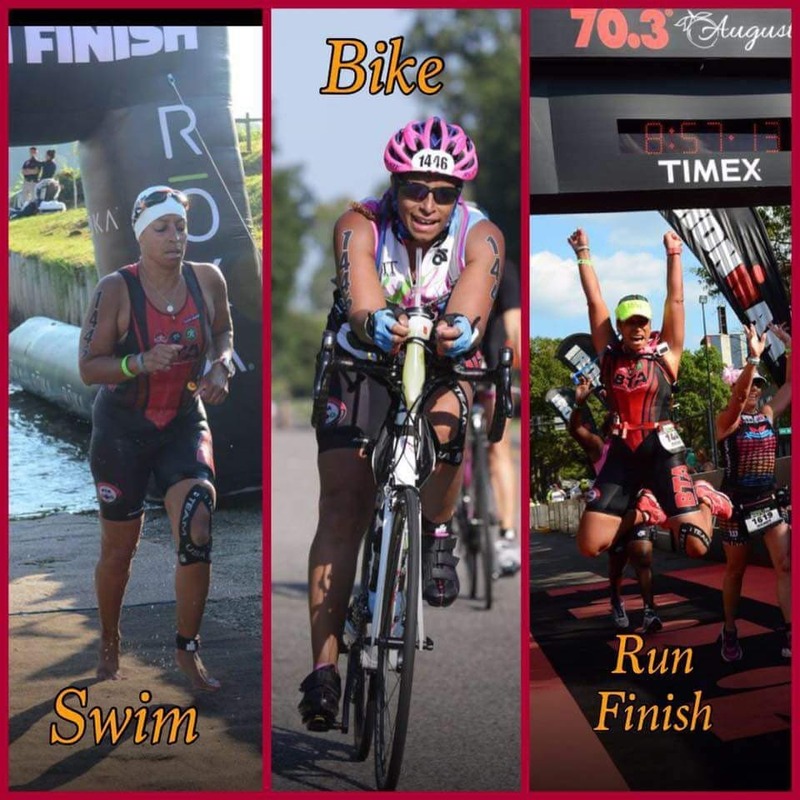 I was living my best life; I was physically fit and training for my first half ironman relay – and I was actually doing the bike! Then, it just kinda hit me. I remember having that initial cry and asking my doctor if I would have to quit training. Luckily, my doctor is an active cyclist. He gave me an emphatic, no. “I want you to keep going,” is what he would say to me. He told me that because I was physically fit, he would use my physical fitness as a gauge. For instance, if I use to be able to ride at 15 mph or 17 mph without an issue, and now I’m struggling to do that, that gives us another thing to gauge. Keep on moving. I kept that in my mind and stayed in the mindset that I need to take care of my family and me, but I can’t sit still and wallow in my own pity party. SI | That’s great that you kept moving, because not everyone can do that. Sometimes the fear of the unknown or what’s next stop people from living life. Dawn | That’s the same approach I took with my first diagnosis. We got the diagnosis, then started talking about what I would do. I cried in my husband’s chest, took a deep breath and said, ok, I’m off to the dance studio now. I was running the front desk of a dance studio and I was a part of the PTA at my daughter’s school. I was leading a major fall fundraiser, so I was busy. I had to keep things moving. I said if I stop and sit down, I may have a pity party that I might not come out of. I’ve always kept that thought process… Keep moving forward. SI | What is the one piece of advice that you hold close? And who gave you that advice? Dawn | This may seem strange, but I don’t know if I ever got advice that I held close. I’ve always been the person who gives advice. I live with the motto, “I live with cancer.” I may have cancer, but I live with cancer. Since I have metastatic breast cancer, every day is breast cancer awareness, not just one month. I will always have cancer until the day I die. I will keep living as long as doctors find the next set of medicines to extend my life. I’m not taking it as the death sentence it could be. Reports say the average life expectancy for metastatic breast cancer is 3 to 5 years. My doctor said when I was diagnosed that we were going for 10 + years. It’s easy to let that diagnosis stop you from living and to go into the sunken place and wallow thinking, 3 to 5 years, what am I going to do? I don’t look at it that way. I’m moving forward and living with cancer. SI | Talking about moving forward and living with cancer. I still see you training and doing triathlons on your social media accounts. How is that going with your treatments? How do you manage? Dawn | It’s been interesting. For the first two years, it was easy because I was on an oral oncolytic, which is not as hard on your body. I was able to relay a half ironman, riding 56 miles on my bike through Augusta. Then in 2016, I did the entire 70.3-mile race. I kept pushing myself through. In September 2017, things started changing with my cancer and I was put on a study. I’m currently on a trial drug study that is more of a traditional chemo treatment that we’re all familiar with. This treatment has been harder on my body but I’ve tolerated it much better than a lot of people I’ve seen. I think I can attribute that to my being so active throughout the years. With that said, I have learned what my limitations are. Your body may tell you, remember you had chemo therapy last week, but that’s ok. Keeping my mental wits and living by my mantra, “I live with cancer”, is how I live. SI | So that answers my next question, what is your mantra? Thank you! SI | Dawn, what would you say is your super power? Dawn | I would have to say the support of my family and my close circle of friends. My family supports me in all of these crazy things I do. I don’t like to do anything locally so my husband supports me when I get on a bike and go ride 56 miles or travel to race. Their support and being there for me gives me that extra support and a huge super power boost. SI | I can totally see that! Based on our conversation, I know there are days that may not be good days. What do you do when you have those days? Dawn | They come few and far between. If I have those moments, I allow myself to have that moment and that mental breakdown and cry. I think it’s important to have those moments when you need to. I may sit in my husband’s chest and cry but I know that I can’t stay there for too long. When I was first diagnosed, I told people that God blessed me with the diagnosis for one of two reasons. Either to light a fire under someone to get checked or to help someone through their journey. I can honestly say, I’ve done both. When I was diagnosed I was in my 30’s. The doctors chalked it up to me having fibrocystic breasts. It was that fight for my medical care that lead me to my diagnoses. SI | Dawn, I think that that is important for people to hear. You are saying that you have to be your own advocate for your body. Dawn | Absolutely. You have to be your own advocate and I am a huge advocate for self-breast exams. My cancer never showed up on mammograms, and hasn’t to this day. My cancer shows up on an ultrasound or cat scan. With self-breast exams, you may not know what you are feeling for but if you do them often, if something feels off, you will know and you can get yourself checked out. I’m sure you’ve heard the saying, save the tatas. Well, sometimes saving the tatas is not what’s best for you. Sometimes the tatas have to go, but check yourself and be your own advocate in the process. SI | Who inspires you and why do they inspire you? Dawn | My girls inspire me. I’ve always wanted them to see me as strong so that they can be strong. I love watching them mature into the young ladies that they’ve grown to become. They inspire me because of the strength that they’ve maintained through all of this. I get the random phone calls from them checking in on me or asking how treatment went. Their love and support keep me going. SI | What advice would you give someone having a hard time finding their get up and go? Dawn | I would say, look deep inside yourself and realize that you are stronger than you think you are. God puts us here for many reasons. They say he doesn’t put more on you than you can bare. I would say, your God will get you through more than you thought you could get through. Pull from your inner strength and get people around you to pull you from that rut! There are days, depending on the treatment, that you don’t even feel like getting out of bed to go pee. Will yourself out of the bed and take the bathroom break. Take it a step further and go downstairs to get a bite to eat. It’s important to keep moving. If you keep moving each day, you will take it another step forward. SI | That’s great advice. One step at a time. Dawn | Yes, your mental attitude is half the battle. Your doctors are going to fight the cancer. You need to fight whatever it is you are going through. I have a girlfriend who was diagnosed with breast cancer after my first diagnosis. She had been feeling this lump for some time but decided to check after I shared my diagnosis with her. Mind you, this was pre-facebook. I remember sending a long email to my line-sisters. There were 34 of us on line. I sent them the email so they would know what was happening with me and it prompted my girlfriend to go get checked. That’s when she found out she had breast cancer. For the first couple of years, she had a good outlook. Then later, she found out she was triple negative, which is a very difficult cancer to fight. At this point, she was starting to give up mentally, deteriorating physically, and then passed away. I tell people that your mental game is important because you need your mind to be as strong as you are to help your body fight. You have to keep your head in the game. SI | Dawn, I have to say thank you because I’ve enjoyed this time with you today. You are truly an inspiration to myself and others. I created the card, “You are my SHERO”, because of women like you. I love everything about you. You are so courageous, brave and I love your energy! Every time I see you, it’s like you light up a room. I love seeing your posts on social media because you keep it so real – the good and the bad. Dawn | I tell people all the time, you get everything and the in-between. I’m never going to sugar coat it. 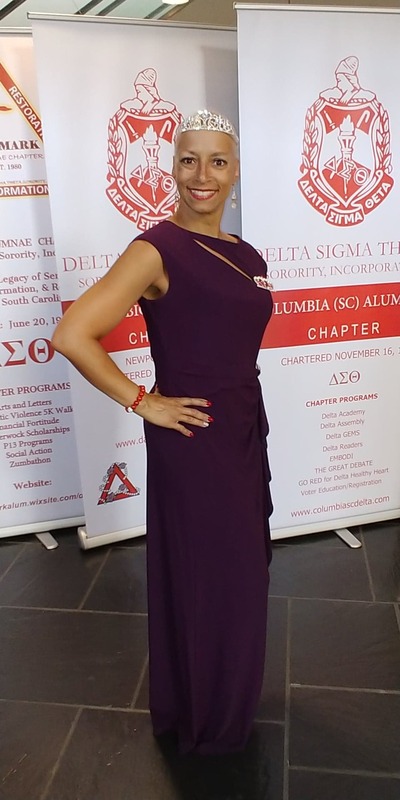 SI | Thank you for sharing your journey!